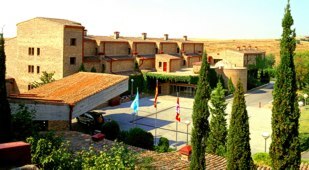 This Parador is about three kilometers from the centre of Segovia which has been declared a World Heritage Site by UNESCO. It is situated on the El Terminillo estate, a site which was chosen for the panoramic view of the city. The skyline is impressive with the city being dominated by the cathedral and the alcazar (castle). During your stay at the Parador Segovia a visit to the city is a must both for the beautiful old buildings and also of the artistry of the interiors. The original walls are largely intact and three of the old gates to the city have been retained. 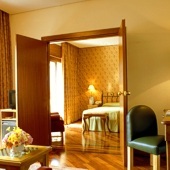 The Segovia Parador itself is modern and welcoming. The very spacious lobby displays modern paintings and decorations. The bedrooms are spacious and comfortable with splendid views of the city. 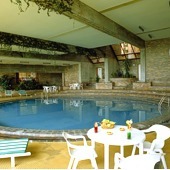 The Hotel has both the outside pool with views over the city for summer use and also a heated indoor pool. Other facilities include tennis court, gymnasium and gift shop. The Easter festivities in Segovia are an attractive spectacle. As are the religious festivals of San Juan and San Pedro held on 24-29 of June. The Parador of Segovia has seventy six twin bedded rooms, twenty seven double rooms, thirteen single rooms and seven suites. All rooms have a telephone, TV canal plus, satellite television, safe and a mini bar. There is air conditioning and central heating throughout the hotel. There is also a gift shop, gymnasium and sauna, currency exchange, wireless internet in communal areas, lift, garage and parking facilities (without security and limited places), satellite television, garden, outdoor swimming pool, heated swimming pool, tennis court, restaurant, bar and facilities for the disabled. A splendid conference centre contains several meeting rooms and has the facilities for a successful business visit. Distance from the nearest airport is approximately 110 kms and the nearest train station is 3 kms away. Reception was polite and helpful but unaware of a special tapas menu being served in the dining room that night. The bedroom was big, clean and had a balcony with a great view of the city. Some aspects of the room (woodwork) appeared more worn than other paradors we stayed at (Toledo, Cordoba, Ronda, Salamanca). The public rooms were impressive in their size and modern architecture and could well host a reception for a few hundred people. The parador is located about a 5 minute drive from the historic town. There is adequate free parking. The restaurant was comparable to other paradors -serving reliably good food (especially breakfast) in a nice setting at prices that were above what one would find at other establishments. If I were visiting Segovia again I would stay at this parador. Comment posted by J. W.
My husband and I were very pleased indeed, the reception was friendly and efficient, we had a large room with a fine view. The public rooms were adequate and the dinner we had was outstanding. We havelkived in Spain a long time and have visited a number of your hotels and this has been the most enjoyable ever. We have recommended to friends. This was our first trip to Spain and it greatly exceeded our expectations. Stays at a number of Paradores contributed to this and Segovia was no exception, although it was very different in style to the others we used. Indeed, with its conference centre it resembled many hotels I used to use during my business life . For all that, it was a very pleasant place to stay, with great views from our room and from around the swimming pool. Staff were helpful and friendly and the dining facilities were good. Our room was comfortable, well equipped and in a good state of repair. However, some of the public areas looked in need of refurbishment. Better signposting on the approach roads into the city would be helpful in terms of finding the place and as one needs a car to visit the old town perhaps a small leaflet on the best places to park would be useful. Or maybe details and costs of taking a taxi. This is probably nit picking as the reception team gave us excellent directions and advice. Would be happy to stay again. Segovia old town is a great place to visit and the aqueduct is a magnificent structure. Reception staff were welcoming. Breakfast, dinner and bar were good. However the hotel looks tired and is in sore need of refurbishment. The bedroom balcony had chipped tiling. We couldn’t walk round to the front of the building for the view of the old town because it was all locked up. Overall needs some improvement to reach the Parador standard. 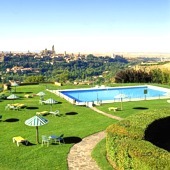 Parador de Segovia is a hotel with panoramic views over Segovia in Spain.